This is what I’ve been eating for breakfast every morning for the past month. It’s total comfort food and makes me feel amazing, even after a night of little sleep. I don’t know about you, but when I find something that I love, I have to have it every. single. day. until I’m sick of it and then I’m onto the next thing for a while. It’s a good thing I have this blog or I’d probably eat the same 3 meals on rotation! This wouldn’t surprise my mom. As a child, I used to only want to wear one outfit over and over. My poor mom had the challenging task to convince me to put on a different outfit before school each day. I remember one of those outfits fondly – a neon pink and green spandex short and tank outfit. Probably with a snap bracelet. Who wouldn’t want to wear that every day? I knew what I was doing back in the 80’s, let me tell you! Now that I have a newborn, I’ve found myself with short “window of opportunities” for personal tasks (shower! eat! get crap done!). I have to move more efficiently then ever and I’m doing most things in half the time. This probably explains why I left the house wearing 1 earring the other day (“new fashion trend?” is what the cashier asked me). After I feed Adriana in the morning, I’m ready to chew my own arm off (unless I have some of my favourite breakfast cookies on hand!). So, rather than raiding the fridge and digging into my dark chocolate macaroon torte at 8am (yup, that happened), I came up with this hot oatmeal that only requires a quick zap of heat. It’s virtually instant! And I’m not talking about those powdery instant oatmeal packets I used to eat in highschool and university. This is real deal oatmeal at a fraction of the time, but you’d never know it. And it’s been working so well for my new routine that I knew I had to share it, as simple as it is. Everyone can appreciate an almost-instant breakfast, right? The magic of this breakfast starts with making vegan overnight oats before bed. I live off of vegan overnight oats (and smoothies) all summer long, but it’s cold and snowy outside and I want something piping hot! My solution? I started making my vegan overnight oats before bed as usual, but now in the morning I throw the soaked oat mixture into a pot and heat it up for a couple minutes. That’s all it takes! Since we’re already soaking the oats and chia seeds overnight, the work is done for you as you sleep. Now all we have to do is heat it up for a minute or two. Then I scoop it into a bowl and throw on some toppings. In 5 minutes flat, I have an incredibly satisfying, nourishing bowl of oatmeal ready to start my day. It looks like a fancy bowl of oatmeal fit for a crunchy breakfast cafe. And that makes me very happy. Keep these toppings close by so you can just throw them on like nobody’s biz-nas. Oh and sometimes I will put a pat of coconut oil or vegan butter on top when I want to crank up the comfort another level. This is a breakfast that makes those wintry cold days just a bit more bearable. Serve with tea or coffee and get COZY! My favourite bowl of hot oatmeal, ready in less than 5 minutes! Soaking the oatmeal mixture overnight cuts down the cook time the morning of—all you have to do is heat it on the stove for a minute or two. Don't forget to mix the ingredients the night before. For a fall twist, add a pinch of cinnamon, ground ginger, and allspice on top of each bowl. Total fall comfort food! Nutrition info is based on 1 serving total. The ground flax is optional because it creates a bit of a strange texture (almost like a flax egg) in this oatmeal. I don't mind it, but some people might. If you think you will, just leave it out or sprinkle some ground flax on top instead. I love topping my oats with spices—a pinch of cinnamon, ground ginger, and allspice create my perfectly spiced bowl. You guys are awesome! I got word that The Oh She Glows Cookbook has made it into the FINAL round of voting in Good Reads Choice Awards! I would love your support (last time I have to ask, thank goodness!!). Thanks for helping us get this far. You can vote here. I’ve been eating oatmeal for breakfast for almost two years now. There is just something so warm and comforting about it! I also went through a phase in middle school where I wanted to wear the exact same outfit to school every day. Mom let me and after a month of wearing this Kermit the Frog posed as a Calvin Klein model shirt (so 90’s) I finally got over that phase. I sympathize with the outfit ordeal, and most women only wear (they say) 10% of their wardrobe! But when you start talking about Trapper Keepers…..I know you’re stuck in the 80’s. Oatmeal is so filling for breakfast, but I never thought to add toasted flaked coconut. Will try for a new spin on the old!!! I just finished up my bowl of oatmeal! :-) I must admit, it didn’t look quite as dazzling as yours but yeah oatmeal is great especially on a snowy day like today! Love the idea of adding mashed banana to my oatmeal. And flax seed. And all of it! You took something mediocre and made it amazing. Thanks! Could you microwave instead of heat on stovetop ? Hi Martha, I dont have a microwave but I assume that would work fine :) I would suggest only heating for 30 second intervals, stirring, heating 30 secs. more, etc. I actually prefer using using the microwave for porridge. Cooking porridge on the stove produces a very runny mucuous affair and you have to stir it or it burns (I still remember my freshly ex-boyfriend sending me a bitter email about me leaving porridged pots in the sink. And it was him who left me!). By contrast, you can cook your porridge straight in the bowl in the microwave and you can have in in any consistency you want. I like to use the jumbo oats and I don’t stir my porridge which produces lovely chewy oatbar-like yumness. I also make 3 min cakes in a cup in my microwave, you should definately investigate this. Yes. I mixed the ingredients together in a bowl last night, put the bowl in fridge. Took bowl out this morning, put it in the microwave for 90 seconds. Perfecto! Best morning meal in a long time. Microwaving food not only destroys most of the nutrients but makes it toxic to the body in the process. A study years ago showed that, when seeds were soaked in water that had been microwaved and then cooled, they would NOT sprout. Do your body a favor and GET RID of your microwave – as I did years ago. nuts or seeds don’t sprout once they have been heated (pasteurized). In general i recommend always to be critical when reading anything, but especially studies. In this particular case i suggest to analyse the entire study (who funded it, what method was used, validity of the evidence and logic of theconclusion). The internet provides a great deal of information. It’s on us to decide whom and what to believe, but i’m sure it’s in everyones best interest to share the most ‘true’ information we can obtain. The microwave-destroys-nutrients-thing is mostly myth, and unfortunately it pops up rather often. Microwave oven heating is often a better way to heat things than to cook them, because all the water is inside the food, so nutrients don’t leak out into the boiling water, and the food is cooked for shorter amounts of time, thus preserving more nutrients. In order for things to get hot, they need to be affected by some form of radiated energy. Having it come from a microwave doesn’t make it dangerous or less nutritious in any way, rather being a gentler process of heating. Plus it’s quicker and saves on the washing up since you dont need as many pots and pans. effects include sleep disorders, fatigue, chronic fatigue, nightmares, fibromyalgia, hormonal disorders, and ADD. These machines can also leak radiation if the seal around the door is not secure. Exposure to this type of radiation can damaging. I prefer to trust to scientific evidence and properly carried out research when discussing subjects such as whether microwaving food is dangerous. I know, how ridiculous when there are so many people who don’t know what they are talking about who are willing to share their opinions with me. Great reply, very balanced. Thank you! I love that you just brought vegan overnight oats to a whole new comfort level with warming them up in the morning! This sounds like the perfect, comforting breakfast! 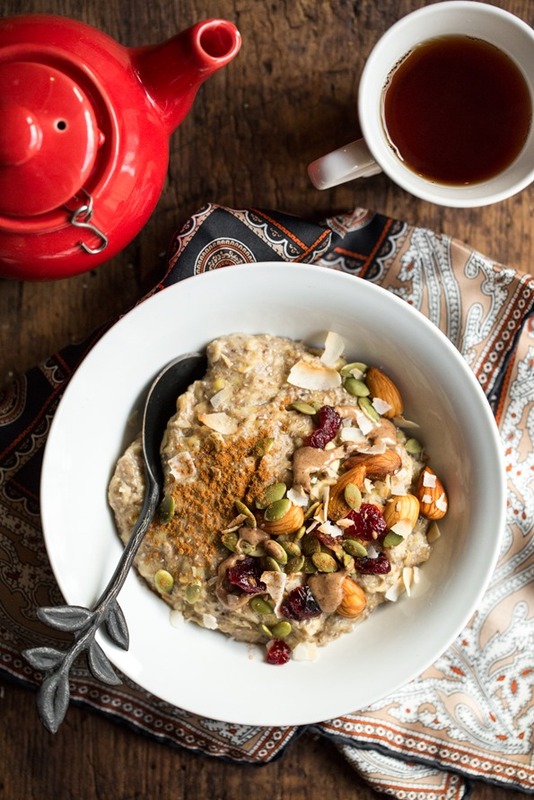 Nothing beats oats in the morning for me :) And I love that spoon – it’s so rustic and adorable!! I love that spoon too! I’d love to know you got a hold of it (if you don’t mind disclosing)? Can totally see why you’ve been eating this every day! Yum! As a new mom I can completely relate on the lack if time. Going to the bathroom can be a task! I can’t wait to give this a whirl! I’m exactly the same with breakfast! Once I find something I like, there is zero touching it for months (sometimes years!) until I am too sick of it to even contemplate it. ;) But I will definitely have to try this out for dinner! Hah – looks delicious! Me too. A couple of years ago, I had a banana-smoothie phase. I drank one every single morning for half a year… and after that not single one for half a year. Haha, I thought it was just me :) Now, I´m into oatmeal, so this recipe is a perfect timesaver. I love the idea of heating up overnight oats for a quick breakfast! Sometimes I want oatmeal but don’t have time to make it in the morning, this is definitely the perfect solution :). Do you think the overnight soaking would reduce the cooking time for some of your other recipes that I love, like carrot-cake oatmeal or sweet-potato/chocolate oatmeal? I can’t see why not – great idea. Let me know if you try any out! I have been on a LaraBar kick lately that with some water seems to keep me going till lunch in the mornings! I love oatmeal though, unfortunately I haven’t tried the overnight oats yet, just the pre-packaged ones. I will have to stop by Whole Foods tonight :). Haha… Eating it now! I didn’t soak overnight because I just read the recipe and little old, impulsive me wanted it now! My daughter got me started on apple pie oatmeal last week so on my day off I made a double batch that lasted me for 3 breakfasts last week. I was just thinking… I can double this and keep it in the fridge for those cold mornings after the 6 am dog walk before I’m off to work. It’s a keeper! Ps just voted! 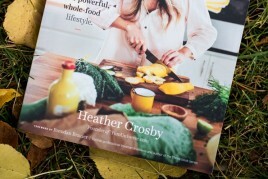 Love the cookbook and have bought 3 so far! Wow that was fast…nice work! So happy you enjoyed it. Good call on doubling it. I tried that once and ended up eating it all the same day…hahah. Thanks for your vote by the way! I do the same thing with routine. Once I find something I like, I eat it all the time until I get sick of it (which could take a months or a year) and then I am done with it. That oatmeal looks great…maybe itll be my new routine haha. I love your leaf spoon!! Where did you buy it!? Thanks :) It was purchased from West Elm a couple years ago! I am in love with bowls of oatmeal right now too! It is total comfort! Once the weather gets cool, I love getting back into my oatmeal! I’m def going to have to try your method of preparing it. I don’t like my oats super goopey, so I haven’t really loved overnight oats that much, but I think I’ll give this a go! This is the perfect autumn breakfast! I love your topping ideas. Pumpkin seeds and cranberries sound like an amazing addition to cinnamon flavored oats. I’ll have to make this soon! I’m the same way! I will eat and wear the same things until I get sick of them and then it’s on to the next thing. Sometimes the routine can be very comforting. I enjoy oatmeal, especially in cold weather. I will have to try this. you make me so hungry right now. Looks delicious. I love this idea and my partner has been looking for ways to cut down on his cooking time in the morning without sacrificing heat. Unfortunately, he really dislikes bananas! Do you have any suggestions for substitutions? Thanks! I would love to know the answer to this also. A quick and warm breakfast in winter sounds perfect – but bananas are the only food on the planet I truly dislike. Try applesauce – that’s how I make my overnight oats – oats, applesauce, (dairy-free) yoghurt and/or milk, chia, coconut, cinnamon, vanilla, and frozen berries (usually raspberries). And next time I will heat it up in the morning!! I think pear would be amazing – just peel it and mash. I heard on CBC recently that sweet potato is even better than pumpkin for pies, so I bet it would be good here too in lieu of bananas…and sweeter than pumpkin. Angela, what is that brown goodness you dolloped on top? The day doesn’t feel right unless I start it off with oats, whether sweet, savory, overnight, in muffins or as pancakes. I also enjoy ground flaxseed in my oats! I am just like you, once I am hooked on a breakfast I will eat it for weeks and weeks! This is a perfect balance for breakfast. Overnight oats are a life saver on rushed mornings! I also make a carrot cake version with shredded carrots, cinnamon/nutmeg, raisins and walnuts. Now that winter seems to be settling in here in Michigan, I’ve started to heat my oats up for a minute or two in the mornings to take the chill off. 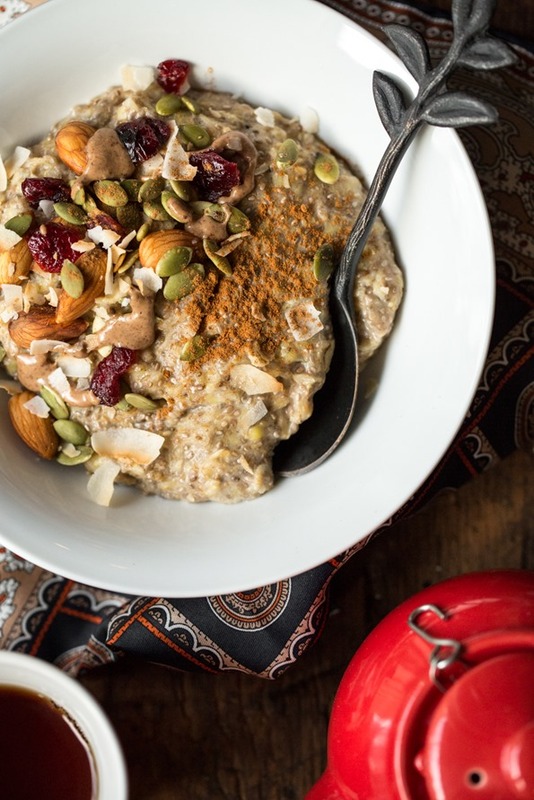 Warm oatmeal is my favorite comfort breakfast too lately – topped with honey, goji and a mix of raw seeds and nuts. Just voted for your book – fingers crossed! I’ve been so stuck on smoothies lately but now that the weather is getting cold this sounds perfect! Yum!!! Ordered your cookbook this morning and just voted. I’ve been trying your overnight oats recipes and love them all. This one will be a keeper too! OmmmNomm! It’s definitely oatmeal weather, and this is a great recipe for us busy in the morning folk. I just had oatmeal for lunch because it makes me happy! I just voted for you again and I hope you win!!! You and your food are awesome! That being said, this looks amazing! I might actually start doing this in the morning to save time. Sometimes I like baking my porridge with the toppings on it already, and I get ready while it’s baking, then gobble it up before leaving the house! I am going to spare you the sappy ramblings of how much I adore you but basically, I found myself on goodreads, after I voted for your book again hehe, and I started to read the reviews and oh. my. god. I started crying! Like the overly dramatic person that I am! I was so beyond happy with all of the wonderful things people were saying about you! I have followed your blog for almost a year now and I must say, you have been one of the biggest motivators and inspirations in my life this past year and I cannot thank you enough! Your success and happiness makes me jump with joy! In the most cliché of terms, haha. I also have a newborn so I understand the need for something fast and easy. Did you know that oatmeal is supposed to help increase your breastmilk supply? Good for mama and baby! I love when recipes like this are posted because it brings all the other oat addicts together for an awesome oat-idea-brainstorm! Love the almond/dried cranberry combo! Any idea on a sub for the banana? I’m allergic. I would try pear for a fun twist (peel and mash first). Another commenter suggested applesauce. Yes!! I’m so glad someone else eats the same thing every day until you get sick of it! I never thought anything of it until I got married and realized my husband wasn’t so thrilled about eating leftovers the very next night or the same meal several days in a row- he thinks I’m crazy, but we’ve learned to compromise and he does drink a green smoothie every weekday now for breakfast :-) How does you hubby feel about it? P.S. 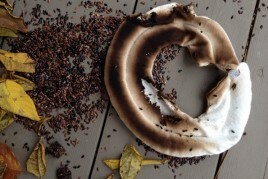 Those are some of my favorite oatmeal toppings, too- looks fantastic! YUUUMM! I’ve been ALL about the oats!!! This looks good – will have to try this tomorrow for breakfast! That looks amazing. I will have to try it- I’ve been wanting oatmeal lately, but never feel like taking the time to do it right in the morning. Not that it even takes that long! Soaking the oats overnight sounds like a great idea. Those soaked almonds look amazing! I’ve been making hazelnut milk lately, and the soaked hazelnuts are incredible. Tis the season for oatmeal, that’s for sure! I haven’t had any yet– WHO AM I!? I am all about the hot brekkies right now, but if you were to pass me a fork for that dark chocolate macaroon torte, I certainly wouldn’t turn it down!! I love the sounds of this recipe. All those toppings are making me seriously crave oats! Yumm this will be my breakfast tomorrow with a cup of indulge tea! I just tried the confort one and it taste sooo good! This looks absolutely delicious! I am always looking for quick breakfast ideas on-the-go, thanks! power bowl is definitely what i would call this! so delicious, beautiful and healthy! Congrats on making it to the final round! Just voted. :) My friend and I made the chocolate pudding cake from your book last night – it was phenomenal! I could have written every single word of this post (except, of course, for the spandex outfit!). It is just totally me! And I happen to eat this oatmeal (same recipe, same toppings) from the day the cold season arrived here in Paris, France (2 or 3 weeks ago, I would say). I love it so much (actually it is the reason why I get up every morning). So delicious, so good for me. It just makes the fall more bearable. Everyone should try it! Love this recipe! I just love oats. Great idea about soaking the almonds to eat them. I learn so much from you!! By the way, I didn’t have cranberries, but had left over fresh cranberry relish from another recipe, it fit perfectly into this one. It adds a hint of orange!! Just had oatmeal for breakfast! Such a great way to start the day off! I never had oatmeal before I knew your blog. Its not that common in Germany. But i fell in love your carrot cake oatmeal and I’m trying to change it up every now and then. I make a big portion at once and then reheat it every morning or eat it cold. Amazing! When i didn’t prepare anything i skip the soaking part and just mix the oats with water, a minute in the microwave and they are ready. I mix them with fresh fruits and everything else I can find. I made this for my kiddos this morning. I didn’t have bananas so I used applesauce instead and followed the rest of recipe as written. Turned out amazingly! I’m doing my longest bike ride yet for charity this Saturday (55 miles) and this looks like an awesome breakfast to eat before. I’m going to make this for sure Friday night! These cold winter mornings have had me craving bagels and toast like crazy! Your 5-minute oatmeal power bowl squashed the craving and kept me feeling full and energetic for hours! Yum! Can you heat up the oatmeal in the microwave? My work doesn’t have a stove. I like to eat oatmeal at the end of the day before I head to the gym right after work. Or will the consistency be different? I dont have a microwave but I assume that would work fine :) I would suggest only heating for 30 second intervals, stirring, heating 30 secs. more, etc. Looks incredible! Do you make your own almond milk for this recipe? I really want to make this oatmeal, but I hate the fake ingredients and added sugar in store bought almond milk. Do you always make yours? Or is there a store brand you use in a pinch? thank you! Hi Kristin, I buy 365 Whole Foods brand and love it. I do make it from time to time as well, but not exclusively! I eat oatmeal every morning too! Just the regular kind though. I will have to try with the pepita seeds! Those look good! I definitely add the flax seed meal along with a clove of garlic and a half teaspoon of freshly grated turmric and a tablespoon of chopped kale to make it more savory and inch up the superfood quotient. Great way to start a day. and grabs rule. best wishes and a thank you from switzerland!! Yum! This look amazing! I can’t wait to try it! What are the benefits of soaking the almonds and pepitas? I soak almonds for your “tuna” recipe, seems to soften them up. Any purpose beyond that? Just wondering. Hi Janna, Yes, soaking them in water helps your body digest them better :) I like to soak overnight. I’ll often put a half cup of almonds in a bowl, cover with water, and then drain and rinse in the morning. It’s a great snack. I keep them in the fridge for up to 3 days. Power bowl is right! This looks so good. I always love your recipes. Anything thats speedy works for me, especially on those days when I am running late for work! 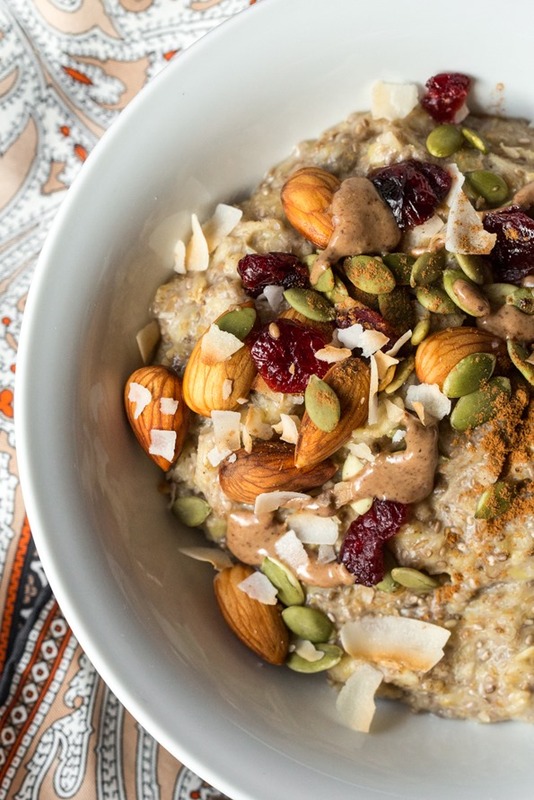 What a perf fall oatmeal! I also can’t get sick of oatmeal. I’m going to try the banana and cranberries in mine next time! Just what I need with a very busy schedule, thank you! So excited to try this recipe! Any tips for making in a crockpot? Thought I might try and make with some steelcut oats…they’re my fave! Just ordered your fab book and voted too! Good Luck! This post has really convinced me that I need to get back on the oatmeal bandwagon! Thank you for the inspiration, Angela! I had this for the first time today and it was real nice and kept me full for a long time throughout the day. I have just made tomorrow mornings. Hey Angela, this looks awesome! I’ve been wanting to make overnight oats (never tried) but it’s the coldness of it that always puts me off, so now I’m super hyped and this will likely turn into my staple breakfast :P there are so many variations that could be done!!! One question though, how can I substitute the banana? applesauce? re-hydrated/mashed dates? nut creams? Help! Bananas disagree with my stomach and make me puke :( so I need to avoid them, but I do want to try this asap! Any help on subbing the banana is greatly appreciated :D thanks! I would try pear – puree it first. would be so seasonal right now too! How long should I soak the almonds for? Made this for breakie the other day – absolutely gorgeous!! I just tried this recipe. It’s delicious!! I left out the banana because mine weren’t ripe yet, but it’s so good. Will keep making this through the cold, snowy season. Thanks so much!!! Double Dark Chocolate Coconut Macaroon Tart for breakfast?? I’m happy to know I’m not the only one. OOOHHHH MMMMYYYY GGGGOOOSSHHH. It is to die for. I don’t even bother with the crust anymore–just mix that yummy goodness and HOPE it lasts in the fridge for a few days. It’s AMAZING! This oatmeal will be on my breakfast table this week for sure. Once again, Angela, you provide my sustenance every day! So thankful for YOU. This is my breakfast on so many mornings! I keep all of my “fixings” together, whether it’s my stash of nuts, chia seeds, hemp hearts, goji berries, pumpkin seeds, etc. I try not to put ALL of them on every time. Congrats on getting your book on Goodreads! I’m definitely voting! Hi there! How is this possibly my first ever visit to Oh She Glows?? Well, I must say, that I too, stick to the same tried and true food items for a while, then switch it up. I’m a big overnight oats eater, and I’ve never thought to heat them in a pot to make them warm. This is a great recipe. Thanks for sharing. Hope you have a lovely weekend, and I’ll be back again! Welcome! :) Hope you enjoy the oatmeal. I found the chia seeds kind of overwhelmed it. In your picture I don’t see chia seeds but when I made it you really did see them. I think I might try it again without the chia and add hemp seeds at the end. Hi Angela! I loooove your recipes!!! They have made it so much more fun and easy way to eat right and feel great about it! I have read how you mentioned you like a challenge when it comes to recipes and coming up with new stuff. Idk if you already have a recipe for it, but do you have any recipes using a green superfood powder? I have vitamineral green and I wish I could take it more often but I don’t feel like drinking it by itself. I know you can put it into smoothies but I’d like to try it with something different, I just don;t know what. If you do have something, is it a good amount? not to where its just a teaspoon in a recipe. you know what I mean? where it;s the main ingrediant. I made this yesterday and, along with most other recipes tried from this site, it is now among my favorites. Thanks for the work you do. This is the only site (and cookbook) I use anymore. OMG! This oatmeal is amazing! I am can’t get enough of how warm, gooey and flavorful it is! This is definitely going to be my go-to breakfast for winter! This is delicious! I always seem to have overripe bananas. I have been making it with Familia Swiss Muesli, pecans, pumpkin seeds, a bit of dried fruit and some unsweetened coconut yogurt. The possibilities are endless! Thank you so much for sharing this quick morning meal, Angela! I love a bowl of hot, homemade oatmeal in the morning but struggle with waking up in time to go through the lengthly process of making it. This seems like the perfect recipe to quicken things up a bit as well as add some extra flavor! What is your reason behind adding 2/3 cup almond milk and 1/3 water instead of just all of one? I think I have a new addiction. Tried it the morning after your post and can’t stop eating it. I love topping mine with pomegrante seeds and honey. Thanks for sharing. I’ve been making gluten free oats (Bobs Red Mill) on the stovetop and adding sliced banana, flax seed, chia seed, walnuts, cinnamon, and coconut chips then serving with Silk soymilk creamer. SO GOOD! Angela, I’m relatively new to your blog (I discovered it via several students in my Food Writing class — they’re super fans). I’ve made a few of your recipes over the last month or so, and they’ve been wonderful — from the coconut-avocado pudding to the vegan Caesar salad. You’ve made me explore some new ingredients and techniques, which has been so refreshing. Mostly, I hover in the land of cheese boards and bright, zesty salads. All this to say, this recipe has become my new morning fave. I love how the oats retain their shape (instead of growing mushy), and the chia seeds add so much body. Thanks for all that you offer here. Cheers! Hi Tenaya, Thank you for your kind words! So happy you are enjoying the recipes so much. Cheers! I totally had that neon outfit too! LOL! 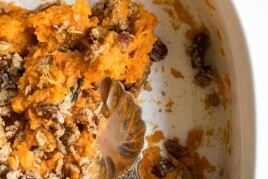 I sit here stuffing my face with leftover candied yam casserole! Hahaha. Oatmeal is amazing. Thanks for sharing. I too have a newborn…and a toddler. Life is busy and I need all the comfort & energy I can get. I always forget to soak my oats and seeds over night, but you have inspired me! God Bless. ps: I have been on your site many times and use your recipes all the time. Thank you so much for your blog. (I too have a blog but have not been able to make time to blog…you have inspired me with this too!) I breastfeed my baby and he has a lot of food sensitivities, especially dairy and soy; so my diet has to be very specific. I am so thankful for folks like you who share what you are doing with vegan cooking/baking. You have made my life much better. Some of my friends and family don’t understand, they think I should just put baby on formula. Your blog is so encouraging. Thanks again! Made this last night for my AM breaky ! Fantastic. I wasn’t even looking for a mid morning snack after the very heavy caseload. Wondering any other suggestions for the banana – if I have just run out? Love this recipe! So good and love the flavour and texture. Great breakfast, especially at this time of year. I enjoy your blog as well, thank you! I love that spoon! Where did you get it? Like you, I’m a serial (cereal?) oatmeal-eater. I’ve made this for breakfast every day for about a week now, and I’m completely in love! I call it the Big Bowl o’Banana Bread, because it tastes just like a really wholesome, delicious banana bread. Mmmmmm. Thank you for your recipes and your you-ness. You’ve changed my life. I’m seriously not exaggerating. Your recipes are helping me love food again. I have this oatmeal as often as I can! It’s THAT yummy. Just a small amount of toppings? I’m not quite sure how much of each to add. This is the best! I love it. I’m so going to try this. Any alternative option to using banana? Just wondering, do you have to soak the almonds separately? Can the almonds just soak in with oatmeal, banana, almond milk, etc? Thank you so much for this recipe! I never liked oatmeal, but feel I should be eating it for the health benefits. I’ve been making a simplified version of this (just banana, oats, almond milk and chia) for a few weeks now and I love it! Wow, that is a fantastic breakfast recipe! Thank you! I didn’t have everything on the list, but I had Bob’s oats, the banana, soy instead of almond milk, and some toasted coconut. Oh and some spices – nutmeg and cinnamon. What a great meal – easy and tasty. Could you just heat this is the microwave in th morning? I don’t have access to a stove at the moment! Love the idea is overnight oats, but hate that they are cold on a winter morning! Great idea to warm up the entire mixture in the am! Loving all your oatmeal recipes! I can’t wait to try the zucchini bread oatmeal and the boozy pineapple baked oatmeal! I would love to see a tea oatmeal or something…. I’ve made this oatmeal a couple of times now and I love it. It’s super easy to make and keeps me full for a long time. I didn’t add the dried fruit, just fresh fruit and some nuts. Thanks so much for the healthy, tasty recipe. I just found your blog and I’m very excited to try more recipes and get your cookbook. Thanks again! Wow, fast! It is so good… yammi ! I like your recipe. why rolled oats? Could you use steel cut oats instead? Is there a difference? Wow, I just put similar ingredients in the refrigerator. However, I don’t plan on cooking the oats to reduce removing some of the nutrients. Mmmmmmmmmmm and the tea with it is a double mmmmmmmmmmm. Great recipe. I made it with oat bran and I didn’t even let it sit overnight. It was great! This looks a great recipe, I can’t wait to try it! But I’m just wondering – I can’t have almond milk due to an allergy… What could I use instead? I just discovered your website and made this oatmeal this morning (in the middle of a snowmageddon in Boston) with a sprinkle of shaved chocolate, a dash of sea salt, and dried cranberries, and it was the best!! Will be saving this and making it every other day during the winter. I have mixed organic ingredients and I’m eating that every day in mornings for breakfast. Now I feel healthy. I just wanted to say that I LOVED this recipe! It was filling, but it didn’t sit in my stomach like a brick. I put crunchy peanut butter, pepitas and hemp seeds on mine, washed it down with a homemade matcha latte, and I was energized for the day! Love your recipes! Keep being you! OMG just tried this recipe. Thank you! I have a 2 year old and a 9 month old and my mornings are a small slice of insanity. This made my life so much easier. Everyone including the baby loved this oatmeal! I am mixing 1 tbsp. peanut butter together with the mashed banana for the extra peanut-flavour-kick. It’s so good and highly recommend to all the peanut butter lovers out there. Does anyone know what the carb/calorie content on this oatmeal is? High protein? Where? I noticed there was not a Nutritional listing. Let’s look at the banana: ALL sugar. Rolled oats: ALL carbs. There is protein from the nuts and some from the milk. But this breakfast – oatmeal alone – is certainly NOT high protein. As a diabetic I do pay close attention to such details. I haven’t tried subbing steel-cut oats in this recipe, but I do know that soaking steel-cut oats overnight drastically reduces the cook time in the morning. It might be worth a shot. The only thing I’m not sure is if the liquid amounts would change. Hope this helps! Correct me if I am asking something wrong, but can anyone suggest a savory version of this recipe? This recipe has become a staple in my morning routines. I really enjoy it! If I don’t add the banana (not a huge fan) should I add more liquid? Or will the milk/water amounts remain the same? Hi – I used pumpkin seeds. I was fearful given some earlier life advice, but, thankfully I did not grow a pumpkin in my stomach as I was warned by my mother many years ago. Thank you for inspiring me to reach for the stars. Do you have an almond milk brand that you would recommend? I would love to make my own but on the days when I need to buy the store bought stuff I would love your suggestion! Also, what brand of rolled oats do you buy? I use Whole Foods 365, if you can’t find that I’d recommend the Silk brand. The rolled oats are Bob’s Red Mill Gluten Free Rolled Oats. Just from looking at this it looks like it would take a long time to prep but this is really simple! Thanks so much for sharing this recipe. I can’t wait to try it. Looks yummy! Does it have to be with a banana, or can you recommend an alternative fruit? Thanks for this and all the other fantastic recipes! So even though it’s nearly 11:00 pm my time, I just made a bowl of this deliciousness. I added everything to it listed (except for the pepitas. I ran out of those 2 days ago.) Instead, I added some macadamia nuts because they were staring at me from the pantry and begging to be thrown in. So, thank you for posting this. Breakfast just became a lot more fun. Hi, I just got your book and am dying to try the porridge recipes, I miss it so much. But I’m terribly intolerant to oats, even more then wheat for some reason. Can I just replace the rolled oats for rolled buckwheat or buckwheat flakes in every recipe? I am thinking about trying this recipe, it sounds amazing! I only have one problem with it, the banana. I really don’t like bananas. Does this oatmeal taste super bananay or is it a light hint of banana? Hi! I can’t wait to try this amazing recipe. But I have one quick question and may be the only one because it has not been asked in the earlier comments. 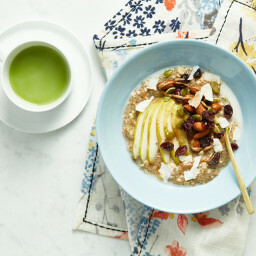 I am obsessed with the branch spoon you have in the picture of the oatmeal! Do you remember the brand name of it I so want it in my kitchen!! Never eaten anything this healthy before lol, think I’m going to have to try it. Just curious though, where did you get that spoon?!? Love this post! Overnight oats are a lifesaver in the winter, especially when I want to optimize my time snuggled up under a warm duvet – plus this is a great change from my usual 5-grain oats, chia seed, cinnamon, vanilla powder, dried cranberry and unsweetened almond milk version. Thanks for the inspiration and greetings from chilly Hamburg! This recipe could be even better if a tablespoon of honey is added to the oatmeal and banana or even peanut butter! to even make this recipe sustainable, Fair trade bananas and oatmeal from local farms could be used! If you live in Seattle, some local farms that grow oatmeal are Metropolitan Market, Trellis, 21 Acres, and The Calf and Kid Ranch so look out for these brands when you are at the grocery store! Also has anyone tried blending the oatmeal and baking it in the oven? I’ve been coming to your website for a few years now, but don’t think I’ve ever left a comment. I just wanted to say thank you for all of these wonderful recipes and for all else you share here on this website. I wish you the best in the NYE with your sweet family. how many calories is in this bowl of oatmeal? I definitely need to try this! I think I will surprise my husband with this recipe for dinner. This looks delicious ! How much calories per serving? Hi Annik, I haven’t calculated the nutritional data myself, but if you plug the recipe information into an online tool like Nutrition Data or Calorie Count.com, it will calculate the calories per serving for you. Hope this helps! I know this is an old post but I just had to comment – thank you for this recipe!! For over a month I’ve been trying to find a breakfast that’s filling enough to tide me over until lunch when I bike 12 km to work every day. And finally today, after having this for breakfast, I didn’t have to deal with an embarrassing rumbling stomach before lunchtime. So excited to keep trying this with different toppings! Hi Larissa, I’m glad the Oatmeal Power Bowl was able to tide you over! A 12 km bike ride every morning (Wow! Impressive!) would definitely work up a monster appetite. :) Have fun experimenting with toppings! Does it have to be heated? I have always soaked my oats overnight and eaten cold from the fridge, which I love. Why soak the seeds and nuts that are being used as a topping? How long do they keep after soaking? Hi April, Soaking the seeds and nuts in water helps your body digest them better, and it can help with nutrient absorption. :) I like to soak overnight, and I’ll often put a half cup of almonds in a bowl, cover with water, and then drain and rinse in the morning. It’s a great snack! I keep them in the fridge for up to 3 days. Angela…just bought your amazing book from Costco and am loving it. Question, can you use Keifer in this recipe? It would be great to add the benefits of a probiotic and boost gut health first thing in the day. Ah!! I love your spoon! Also, I’ve been going through your blog and just pinning a BUNCH of recipes, haha! All of your food looks so good. I’ve made your Hunky Heartbeet Cabbage Soup and it was delicious! I am now attempting a not-overnight version of this. Hopefully it turns out! This oatmeal sounds amazing. I can hardly wait to make. I’ve been looking for an amazing oatmeal recipe, and I think I just found it. Thank you! hola, esta receta vaya que me ha encantado pero que pasa si no dejo remojar la avena con todo lo demás toda la noche? Hi Marcela, I recommend soaking the oats along with everything else as it allows them to soften and thicken the oatmeal. Hope this helps! Hey Jenna, I don’t have a microwave but I assume that would work fine :) I would suggest only heating for 30 second intervals, stirring, heating 30 secs more, etc. I first want to say I love everything about your Oh She Glows cookbook and website and JUST noticed you now have an app! Woohoo!! I seriously love how approachable your recipes are and you have made it BEYOND simple for me to cook these meals at home for my family without having to fill my pantry with super special ingredients. I have yet to make something that dislike. Thank you! How much is a “serving size”? Awww thank you so much Ashley!! This truly means the world to me to hear this. I can’t thank you enough for your support and encouragement! It’s really why I do what I do, so to hear that the recipes make an impact in your life is so great to hear.